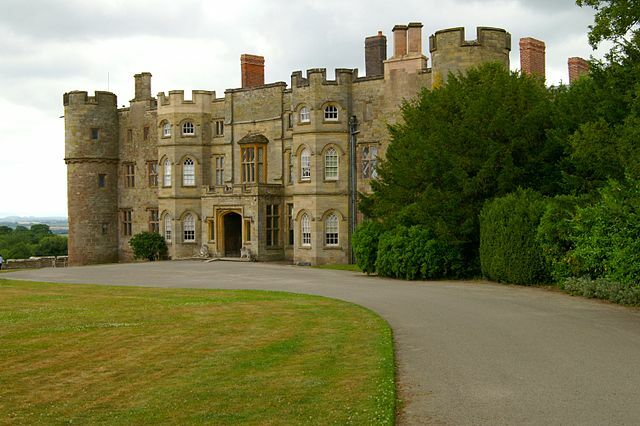 Notes: Croft Castle is a castle, church and garden located at Yarpole, Herefordshire, England. A building has been on the site from the 11th century and it has from this time been the home of the Croft family and Croft baronets. The Croft family were closely linked to their neighbours the Mortimers of Wigmore and later Ludlow. The Battle of Mortimer's Cross took place on Croft lands nearby in 1461. The present building originated as a castle in the 14th century and has been much altered since. It was the home of a John Croft who married one of Owain Glyndwr's daughters. In the 15th century the Croft family adopted the Welsh Wyvern crest, a wounded black dragon, seen as a subtle allusion to their Glyndwr heritage. Croft Castle was restored after slighting in the Civil War. It now consists of a stone quadrangular manor house with a small castellated round tower at each corner and a small square tower flanking the north side. The castle is under the care of the National Trust and members of the Croft family still live within it. The manor house has a quadrectangular structure around a central courtyard. The north side of the building is not parallel to the south side. The outside walls of the building date from the 15th century. The building has four circular towers on each corner of the structure, although they are too slender to be defensive structures. The north range is Elizabethan, while the other ranges date later than 1746, and are Georgian in design. The building originally had a parapet, which was later removed. The sash windows were a later addition. The entrance porch, which has flanking parapets, is also Georgian, although it may have been located on the site of a former gatehouse. The castle was the home of the Croft family for nearly 1000 years. It may have been built by Richard Croft. The Croft family was recorded as living in the structure in the Domesday Book. It was purchased by Richard Knight[ disambiguation needed] in 1746. The building was bought back by the Croft family in 1923. It was Grade I listed by Historic England on 8 November 1956. It is similar in appearance to Treago Castle.